It's the day after Thanksgiving and I'm sitting here waiting to be brought a plate of leftovers. We had the best Thanksgiving meal. Every recipe was so good! But enough about delicious dinners. Today I've got a project for you. 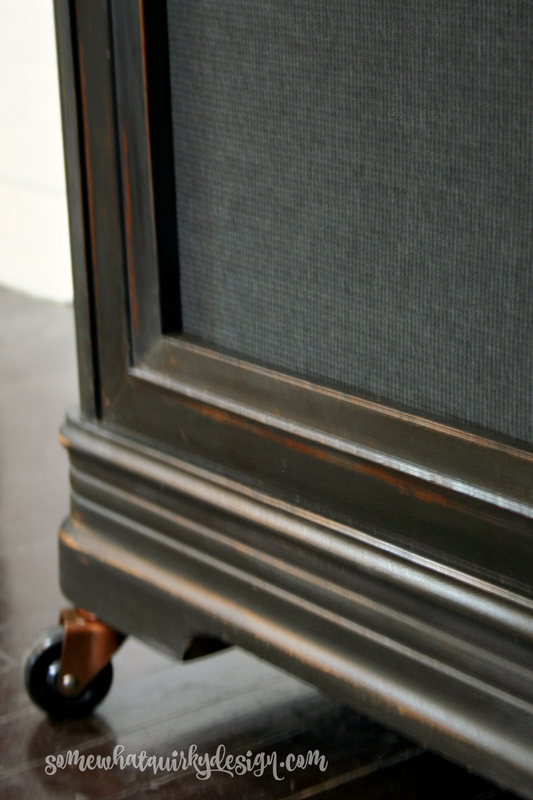 Several years ago I bought an old radio cabinet that I was certain that I could make something cool from. I'm thinking this cabinet is from the late 50's. That's a big guess, based more on the appearance of the electronics than the furniture itself. I don't have any pictures of what it looked like before I took out the turntable and the radio. And frankly, I only remember taking out the turntable, so maybe the radio was gone when I bought it? The upper left section pulls out like a drawer and held the turntable. 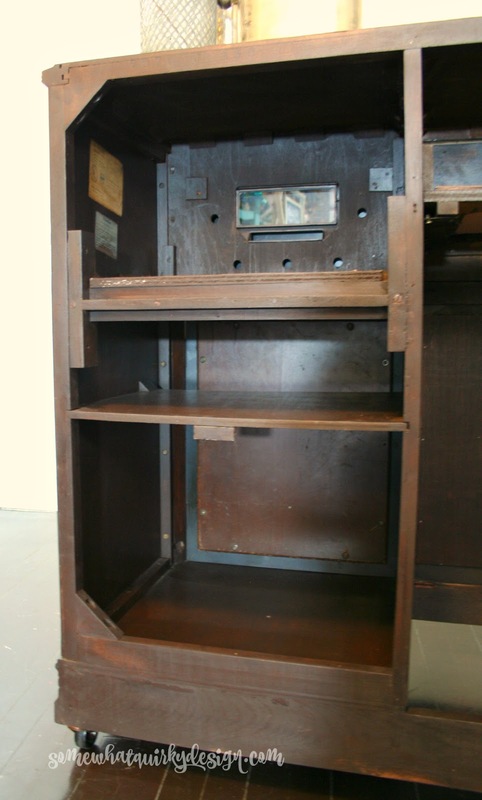 The upper right section door lowers down and that's where the face of the radio is. 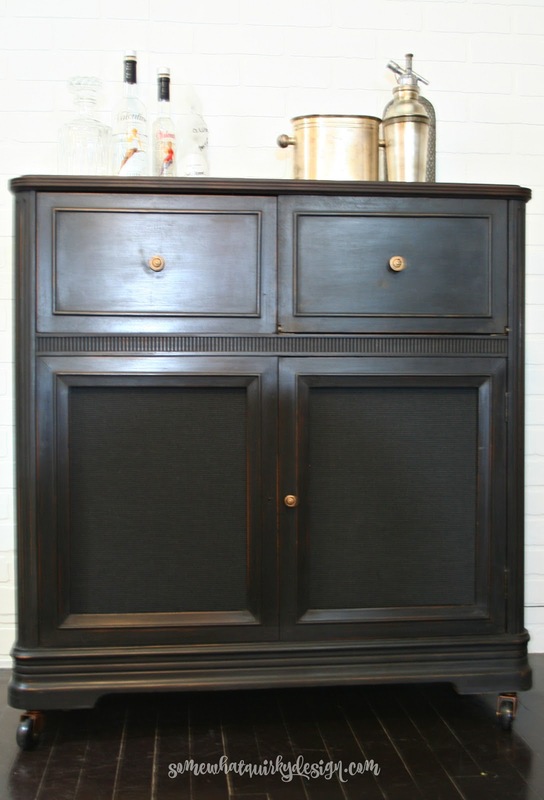 The bottom left cabinet is fixed closed and held a large speaker. If you look closely you can see the circle shape of the speaker behind the fabric. The fabric panel on the right is glued to a panel that is screwed on to the door panel. The entire back of the cabinet is open and I decided to leave it that way to make the bar usable from the front and back. 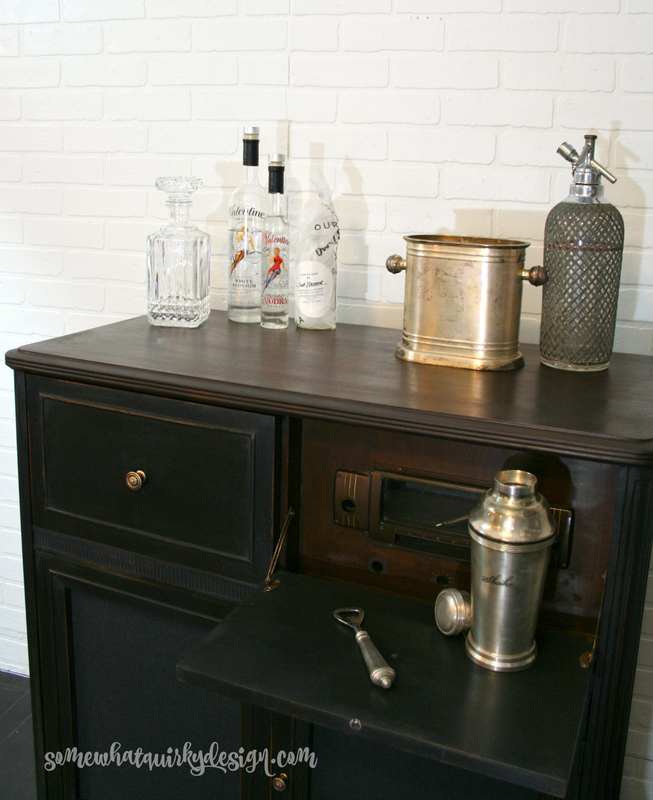 A person can tend bar from behind the bar or have access to most of the storage from the front as well. I removed the speaker panel and replaced it with a piece of 1/4" plywood. 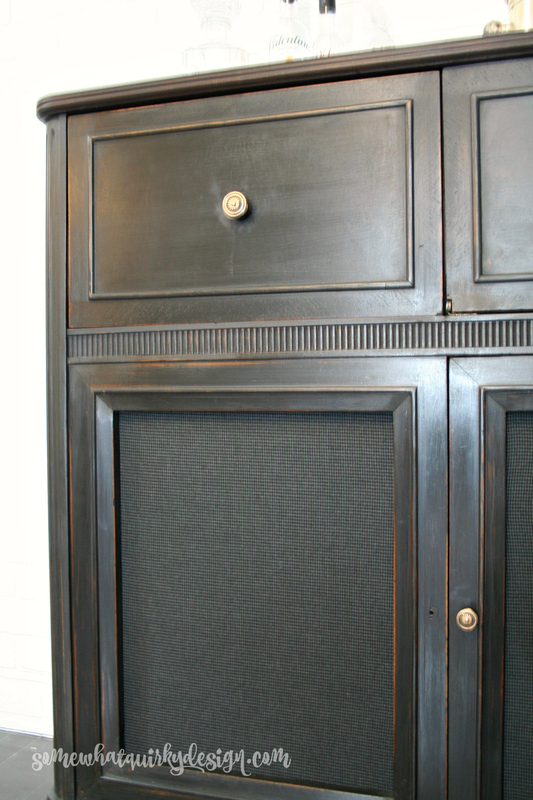 Both panels were covered with a piece of grey and black herringbone suit weight wool. The entire interior was treated with a gel stain to unify the color of the woods and freshen up the finish. I used a light coat of soft wax over each surface. 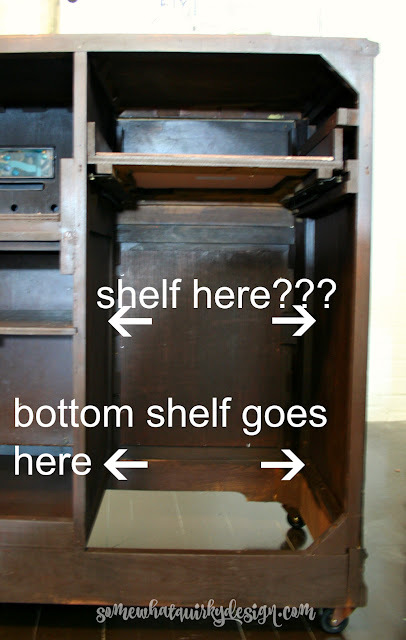 A coat of poly would also work here and possibly be easier than waxing the sides and inside the short shelves. 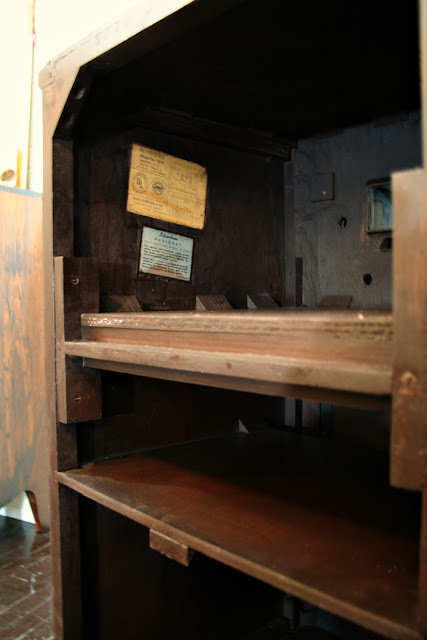 I love the inside of this section where the radio used to be - all the UL information was listed and on the other side all the electronic schematics. I feel like the shelving on this side is spaced in a good way for a bar, but the other side just has the drawer and then one big gaping space. I have the plywood for the bottom of this area, but I grossly mis-measured the wood for this space and adjustments are required. I'm debating whether to hang a wine glass rack from the bottom of the drawer shelf or make a shelf mid-way down that wine glasses can just sit on. The drawer where the turntable used to be was actually just a framework around the edges so I glued a piece down to cover to make an actual drawer bottom. 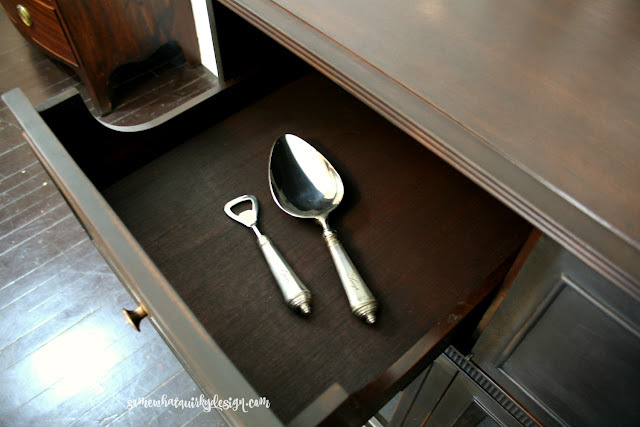 This drawer is deep enough to hold any bar supplies that I can think of. I received a package of products to try from Velvet Finishes. I know of a few painters who love their products and was excited to try them. The outside of the cabinet was painted with Velvet Finishes Luxurious. I used two coats and then sanded the whole piece smooth and distressed most of the edges. 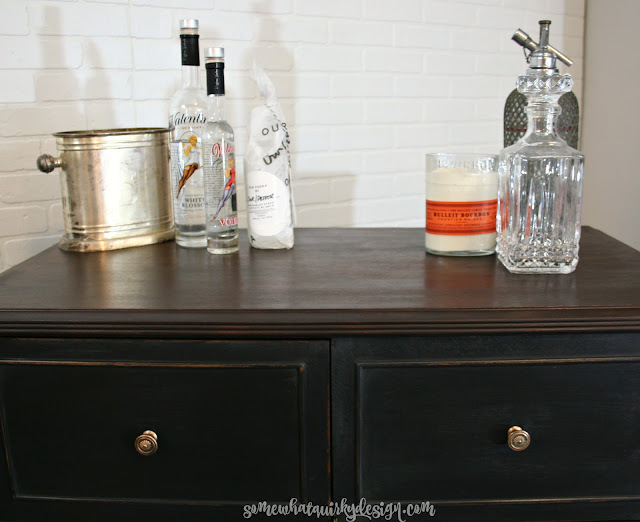 I used Annie Sloan Dark Wax over the entire piece. When I initially cleaned and sanded the piece I stripped the top with lacquer and varnish remover. 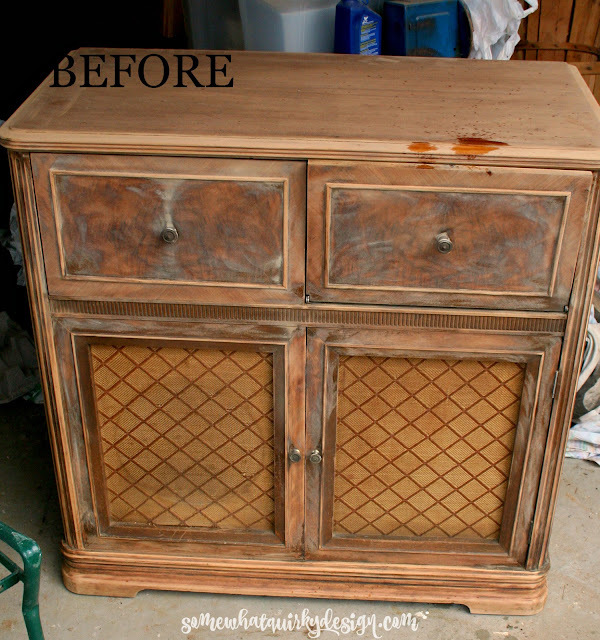 Once it was clean I stained it with General Finishes Java Gel Stain. Let's talk cleaning. This piece had been in my garage for at least two years and who knows how many years it was in the garage or basement of the people I bought it from for $5.00. Between the dirt, the spider nests, and the sanding dust this piece needed to be WASHED. So I vacuumed it out, washed it down with water and a rag. THEN I used Velvet Finishes Prepare to wash off the dusty film that had dried over the whole thing. Prepare probably would have been sufficient but I was too cheap to use it over all that dirt. Velvet Finishes is a latex paint and it had been a long time since I used latex paint for furniture. I was a little apprehensive but it was great to work with. These are the original knobs, but they didn't clean up very nice so I used a little Rub-n-Buff on them. I also had a small problem with one of the bottom handles. These are the kind of handles where the screw comes through from the back and screws into the knob itself. Usually I place the screw back into the knob after it is removed to reduce the chance that I might lose the screw. Somehow the screw got stuck in the handle and I have been unable to get it out! Thus I had to photograph the cabinet/bar without one of its handles. Oops! I'm really pleased with the fabric I found to replace that nasty faded golden stuff that was on it before. I really love the radio front. It's way cool. Oh look, there's an unblurry picture of the casters! I'd like to thank Velvet Finishes for providing me with the product to do this project (and a few more!). Hope you enjoy the rest of your holiday weekend! Wow, that really turned out great! I love that the radio stayed there and you can just use the fold down piece as a surface for prepping drinks, so cool! 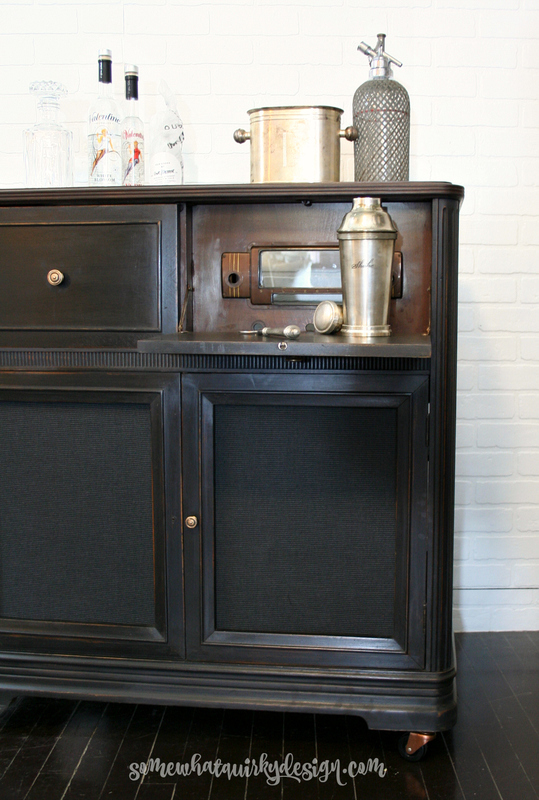 I just ordered a bar cart for myself but I wish I had something as cool as this instead!! Karen, this is beautiful. I love the rich color and it's simple elegance. Great job! Love that you saved this piece Karen and repurposed it, it's got great bones! Adding the wine glass holder is a great idea, it would prevent any delicate wine glass chipping mishaps in case you have to roll it in another room for a party, love the color it's ready for a black tie affair now! 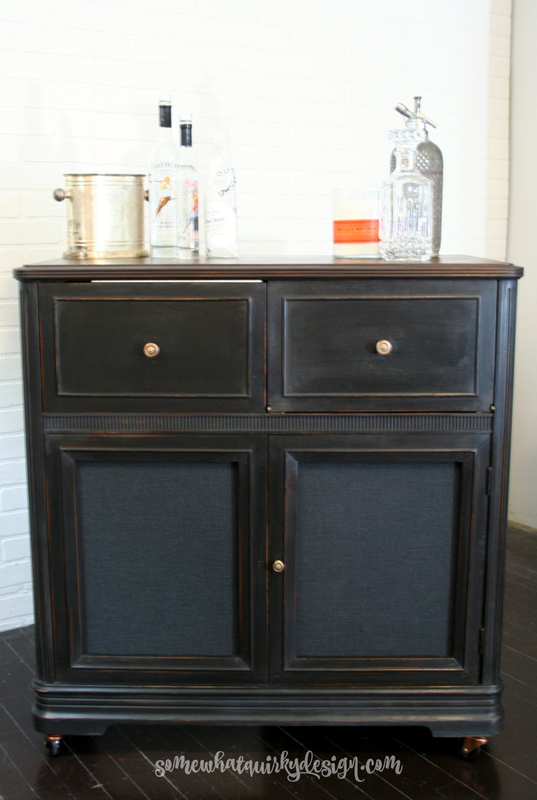 This is perfect for a small space, and I love the masculine look! I love it! What's on the beverage menu for the weekend? A definite WOW, Karen! What a great job. You have inspired me! I am turning an old record cabinet into my coffee bar. I love this one and it turned out great even with the missing knob!